This extraordinary chalice takes its inspiration from dragon-stem goblets made by the legendary Venetian glassworkers in the seventeenth century. In this example, also made in Venice but in the late nineteenth century by Salviati & Company, the dragons have been elevated to the body of the cup. Several remarkable glassworking techniques are on display in this object. The main cup component was formed by rolling canes (rods) of glass in colorless (clear) glass and mouth-blowing the shape. The canes themselves had previously been worked, beginning as one very long rod of colorless glass containing two speckled gold lines between which were several very thin lines of pink glass. While still hot, the rod was twisted to form the spirals. Once cool, the long rod was cut into pieces, which were then rolled over with a gather (blob) of molten colorless glass to form a cylinder. That cylinder was blown and shaped by hand to form a cup with a tapered bottom. A separate gather was similarly rolled in the twisted—or retorti—cane to form the foot of the goblet. A blown and molded piece of lightly gold-specked colorless glass forms the stem, to either end of which the cup and foot were attached. 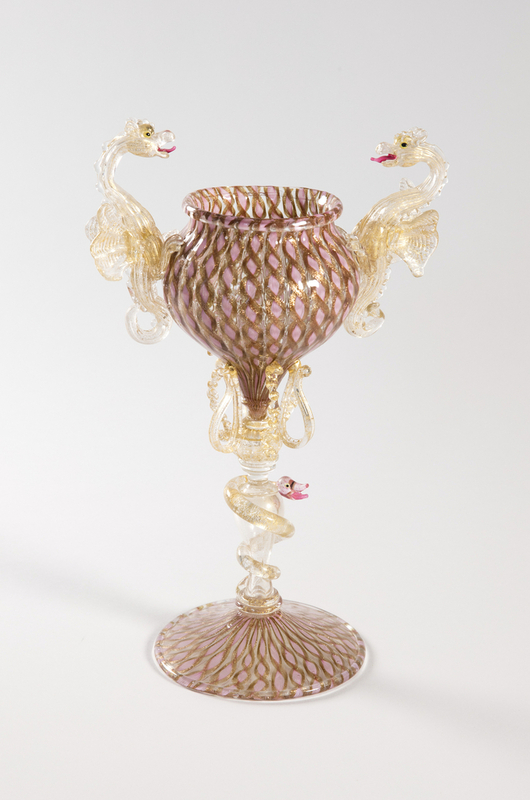 Next, the dragons and other added pieces, such as the serpent circling the stem and the looped pieces of glass attached to the bottom of the cup, were formed by hand, mostly from clear glass with crumbled gold leaf plus some additional bits of colored glass to form the pink tongues and black eyes. All of this would have been done with metal and wooden tools while the glass was molten and extremely hot, roughly 1000º F. Once these added pieces were attached to the goblet, the entire object would have had to set and slowly cool in an oven—a process known as annealing. A true wonder of artistry and skill, this chalice recently joined Cooper Hewitt’s collection and is currently on view in the exhibition The Virtue in Vice. Although it is in the form of a drinking vessel, this object almost certainly was designed and used only for display.